As we celebrate 59 years of nationhood, I am reminded of the latest achievement we had 2 weeks ago in KL, where commitment to target IoT as a new national economic source was reiterated by the Minister of Technology, Science and Innovation himself. Malaysia is one of only nine countries in the world to have developed a working roadmap on IoT. We're currently in the midst of implementing the National IoT Strategic Roadmap, in which interoperability has been identified to spur IoT in the country, and the market potential is set to generate a GNI of RM9.5 billion by 2020 and achieve RM42.5 billion by 2025. For Safety - IoT has been employed in Smart Lock-Up to monitor safety in the police lock-up (implemented by the Royal Malaysian Police. For Community - A community social innovation platform called I-Comm has been deployed to develop applications like flood monitoring. Its scope will be expanded to cover tourism application as well. For Agriculture - IoT plays a key role to assist the export of premium durian to China and other premium product. For Transportation - Taxi booking applications have been enabled, e.g. iTeksi, GrabCar. At the 10th edition of Asia IoT Business Platform two weeks ago, YB Datuk Seri Panglima Madius Tangau, Minister of Science, Technology and Innovation mentioned that following the maturing of IoT technologies in the country, they hope to expand local services to ASEAN markets and ultimately introduce top 5 Malaysian companies to the international stage. In developing the industry ecosystem, we need all players to work together and demonstrate the value of these solutions in order to convince the end users and investors to adopt IoT technologies. Transportation - to improve efficiency and service level of transport operations. Companies like Prasarana Malaysia will gladly welcome solutions that can help improve public transportation and passenger info. Manufacturing - to enhance supply chain efficiency and reduce the gap between SMEs and MNCs. With manufacturing taking up 30% of the whole IoT market potential in Malaysia, we're seeing increasing number of services from ERPs, supply chain integration, Digital/Connected Factories to Industrial Automation and IIoT, etc. Healthcare - to improve healthcare service delivery. Strongly encouraged by the government, solutions like predictive health analytics for hospitals and doctors to deliver better patient care; modernising healthcare with Artificial Intelligence, etc. are currently driven by local startups like AIME, Vital Synapse. Agriculture - to boost income of the B40 community by enhancing sectorial productivity while preserving national food security. This is particularly seen to be a strategic segment. With collaboration efforts between vendors and across industries being supervised by the government, it is without a doubt that IoT would play a big part in achieving our next stage of nation's growth. I am happy to facilitate further IoT initiatives and relationships in and across countries, and support MOSTI's goal to help Malaysian companies expand into the whole of ASEAN region. 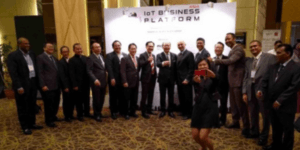 Feel free to drop me a note if you're interested in the ASEAN IoT markets.